Based in Asheville, North Carolina, we provide a full array of residential and commercial landscaping and lawn care services. Carefree Landscapes has been designing and installing landscapes for clients in Western North Carolina for 25 years. Whether it's new construction or an existing home, new plant beds or a complete facelift for old beds, we can help! 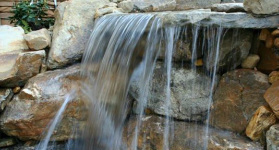 Hardscapes & water features are some of our specialties. Patios, retaining walls, firepits, steps and walkways can all make your property stand out, and help you to utilize and enjoy your outdoor space the way you would like to! Find out how we can make your property an oasis! Welcome to Carefree Landscapes Online! We're so glad you found us and hope that this website gives you the confidence you need to invite us to create a carefree landscape for you home or office. For 27 years, we've been doing Asheville landscaping, helping clients just like you in Western North Carolina create and manage outdoor spaces that reflect the beauty, style and excellence that you expect. No matter the size of the project, we strive to exceed your expectations in everything we do. Whether you need a fresh landscape design, custom hardscape like a retaining wall, outdoor fireplace or water feature, or simply someone to manage your landscape maintenance, Carefree Landscapes can be your solution. What are your dreams for your outdoor living space this year? Let us help you realize these dreams! If a healthier, more beautiful lawn is you goal, we can help you achieve that with sod or seeding, and proper turf fertilization. We are experts at landscape design and installation, whether you want one area renovated, or an entire new landscape. Boulder and rock work is a specialty for us. Firepits, boulder walls, patios... you name it! We can make your dreams come true! Lawn and landscape maintenance contracts are our way of insuring that your outdoor living space always looks its best! Carefree Landscapes provides high quality landscape services to Asheville, NC, and the entire Buncombe and Henderson County areas. We specialize in landscape design and installation, retaining walls and patios, lawn cutting services, landscape maintenance including fertilization and cleanup, drainage solutions, water features, and many other types of custom projects. Danny Scroggs is a NC Licensed Landscape Contractor (#0564), and also a NC Licensed Irrigation Contractor (#535). We are licensed, fully insured, and bonded for your protection. We take pride in "doing the job right the first time". You can reach us directly at 828-808-4725 to learn more about our Asheville landscaping and irrigation services. Are you ready for a change in your landscape? We work through the winter months, and we are booking now for spring landscaping projects! Design and install a completely new landscape. Renovate your tired lawn, transforming it into a thing of beauty. Install an irrigation system to keep your landscape healthy no matter what the weather brings. Add a new flower or shrub bed or area. Install a waterfall and water feature. Add a rock or paver patio. Build a boulder or block retaining wall. Build beautiful rock steps or a walkway. Renovate your tired, worn out landscape by removing overgrown shrubs, designing a creative landscape, and installing exciting new plants! Looking for an Asheville landscaper who's an expert in the business? We offer professional landscaping design and build services to residences of Fletcher, Arden, Fairview, Asheville, Hendersonville and surrounding areas. It's our goal to meet and exceed your expectations. Servicing Fairview, NC and all the surrounding areas. Call us now at 828-808-4725 to learn more. Lawn Mowing and Landscape Care in Asheville, Fairview and Fletcher! Are you looking for professional quality lawn care and landscape maintenance ? Carefree Landscapes provides reliable, high quality lawn mowing and maintenance in Asheville and surrounding areas. We also provide spring cleanup, lawn fertilization programs, mulching, and lawn seeding services. Lawn services are available on a contract basis, or per cut. Call Danny Scroggs for more information on the lawn services we provide! Copyright 2014. Carefree Landscapes Inc. All Rights Reserved.